If you are ever walking along King Street and Union Street you might hear beautiful music in the air. If you follow this unique sound it will bring you to Jamey Turner as he plays his “Glass Harp” in front of Vola’s High Tide Lounge. You will be amazed at the music that is created by rubbing the rim of a glass with slightly wetted fingertips. We have all, at one time or another, rubbed a wine glass while sitting at a table, but Jamey plays a table full of glasses, each revealing its own note. Jamey grew up in Montana and Colorado where he learned to play the clarinet and played it professionally in military bands. He is also accomplished on the piano, musical saw and his own invention: the wrench harp, wrenches of various sizes suspended on a frame and stuck with hammers. 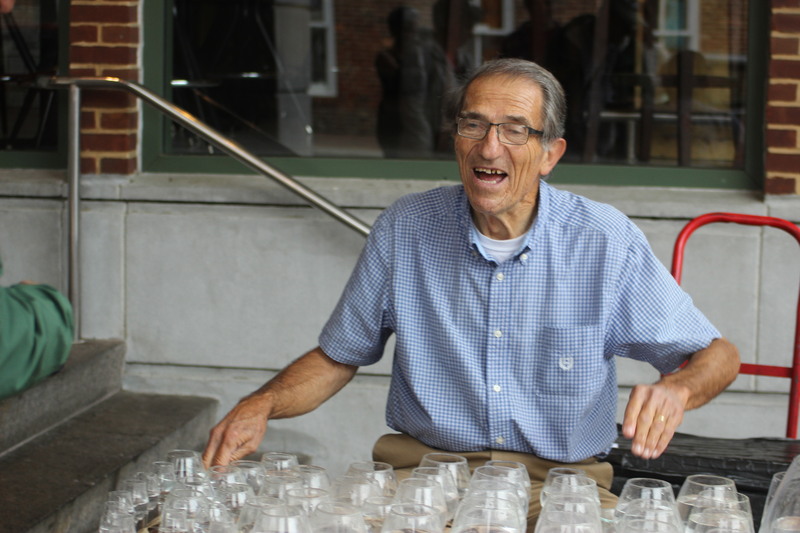 He has appeared on the old Johnny Carson Show playing his saw as well as his glass harp. Over the years Jamey has performed at such recognizable venues as The Kennedy Center, Disney World, National Symphony Orchestra, Philadelphia Orchestra, Washington National Cathedral, Today Show, Good Morning America, Busch Gardens, Wolf Trap National Park and the opening of Universal Studios in Tampa, Florida and many more. Jamey attributes a lot of his success to his wife Mary of 44 years. “Mary was all around music and her dad, Dr. Harry Fletcher lived in the Virginia area and had an incredible music collection, so we moved out here to be around him about 30 years ago,” he tells me. Today the 77 year old Jamey Turner and Mary live in nearby Mount Vernon. Although he performs at corporate events, schools and a variety of venues, he particularly likes to perform outside in Old Town Alexandria. The table that his glasses sit on is 25 years old and is made of juniper wood from Florida. “We discovered that Juniper made for a great sounding board but soon discovered that it was prone to cracking,” he says. “We added Oak strips around the edges to encase the Juniper.” The glasses are secured to the table by thick rubber bands and I was surprised to learn that they will last for a couple of months before being replaced. As it turns out, he had to replace the rubber band for a glass right in the middle of the board while doing this interview. 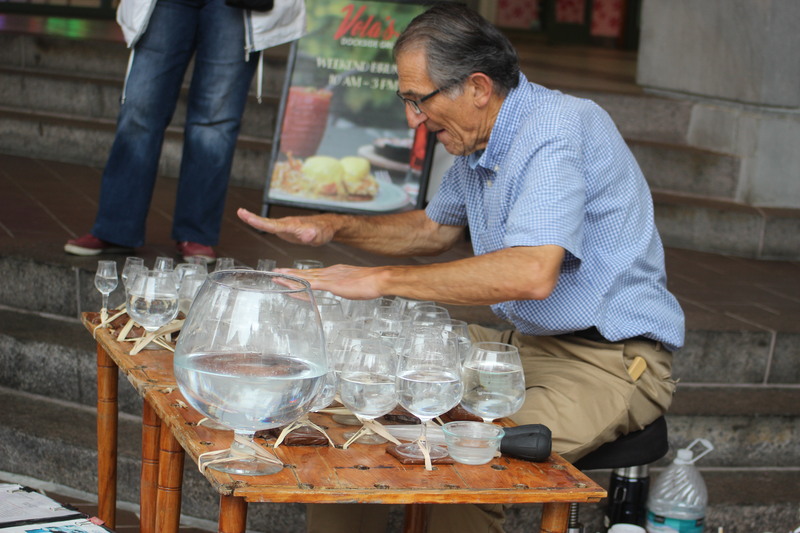 Although you don’t see the glass harp played in many places, it does have a long history. Jamey told me of an early player, Georg Philipp Harsdorffer (1607-1658) a Baroque-period poet and translator, who tuned his glasses with wine, then passed them out to his friends and had them all play together. “I imagine he had trouble keeping his glasses in tune,” says Jamey. It takes about an hour for Jamey to set his tables up and get his glasses tuned each time he performs. This requires a lot of love and patience. To keep his fingers moist he keeps re-wetting them with distilled water from two bowls at his side. The distilled water creates more friction and makes the playing a little easier. If you are in Old Town, take a walk down King Street toward the water and you will find Jamey entertaining the crowds. He is a true talent and performer and loves to engage with the audience. We first wrote about him a little after we started the Old Town Crier in 1988 and the man is still in tune. It has been a pleasure to have known him for all these years. « Carson the Wonder Cat! A wonderful man. They have been homeless (or car camping, occasional hotel hopping) for 3 years. They tend to disappear from family and friends that would like to provide shelter or possible options of retirement communities to help with Jamey’s delicate heart condition and memory troubles. Please be kind to this icon of the City of Alexandria. His wife is a bit of a bible thumper with some strange ideas of how God does everything for them as they get further behind financially without shelter and suffers from hearing loss and paranoia. He will surely not make it if she gets spooked and disappears with him. I overheard her in a panic on the phone the other day asking where Jamey’s medicine that it had been a day and a half since he had it. I wanted to ask her if there was anything I could do to help. It must have been someone they know. I hope the person on the other end was providing shelter or support. I would love to step in and help but they appear independent but the more I learn from others in town the more afraid I become for them. I feel very bad for the couple. The streets are a hard life at any age. Mr. Turner played on Sproul Plaza at UC Berkeley when I lived there. I was so delighted to see him in a free concert at the Kennedy Center…!